Brad Pitt stars in the absurdist War Machine, opening on May 26th in UK cinemas and on Netflix. In autumn 2015, The Enterprise Pub in Camden hosted 200 of the film’s cast and crew as it doubled for an Irish bar in Paris. The film is described as part reality, part parody, with Pitt depicting a born leader’s march into folly. Pitt plays General Glen McMahon, based on real-life general Stanley McChrystal. McChrystal’s career in Afghanistan ended after he featured in Rolling Stone magazine expose The Runaway General. In the Rolling Stone article, the Paris pub in question is the real-life Kitty O’Shea’s, a touristy Irish bar, chosen for being the least “Gucci” place the general’s staff could find. The occasion was McChrystal’s 33rd wedding anniversary celebrated not only with his wife Annie, but also his entire inner circle. According to the Rolling Stone feature, McChrystal’s real-life staff in 2010, then the most powerful force shaping US policy in Afghanistan, called themselves Team America, in reference to that satirical movie, which, among other things, lampoons the White House. For the movie, Brad Pitt and his co-stars, along with 200 other cast and crew, headed to The Enterprise Pub on Red Lion Street. They filmed the scene there in October 2015. You’ll see snippets from this filming in the trailer. FilmFixer manages the film office service for Camden Council. FilmFixer director Andrew Pavord said, “Brad Pitt and his production could film the interior of a Paris pub anywhere in the world. We’re delighted that The Enterprise in London was chosen. 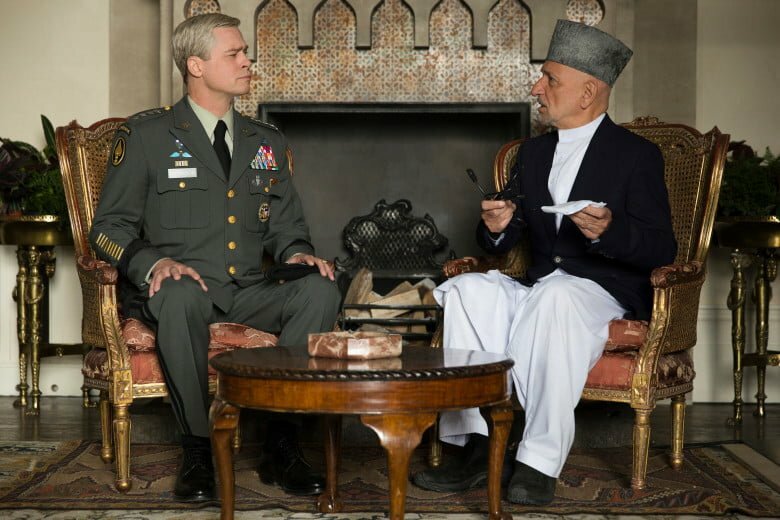 Elsewhere in London, Pitt filmed scenes with Sir Ben Kingsley – as Afghan President Karzai – in Croydon’s Addington Palace over two days in autumn 2015. The Rolling Stone journalist behind the story, Michael Hastings, died a car accident in Los Angeles, aged 33.